If you’re looking for an alternative to carpet or hardwood, then consider our high-quality tile flooring in Plaistow, NH. Created with a variety of designs, plus moisture-resistance, easy maintenance, and long-lasting durability, our ceramic tile is an ideal choice for any of your home floors. You never have to compromise on budget or style when you choose quality tile. Visit our well-stocked local showroom and explore our eclectic inventory today. We may be a part of a franchise, but we’re also locally owned. That means that our flooring store caters to the specific needs of you and other local residents. You don’t need to drive out of your way to find products you want. Customer service is at the forefront of our business. When you come to our store, you can expect to receive a truly unique level of service that is unmatched by our competitors. If you’re looking for a way to increase your home’s property value, a floor made of tile is a smart choice. Old, worn floors are unattractive and drive down the value of your home. Our showroom has a variety of colors, styles, and hues to choose from. No matter what you’re looking for, our associates can find it for you. New flooring adds appeal and charm to a home that prospective homebuyers will surely appreciate. Browse through our assortment of porcelain, ceramic, and slate tile today. Achieve a stylish and modern appeal with high-density porcelain tile, which is a great choice for any area or room in your home. It is rugged enough to withstand high-traffic and outdoor areas, while maintaining its visual appeal and durability. It is created with heated and refined clay, making it a popular alternative to natural stone. This type of flooring is extremely versatile and is available in a wide variety of colors, finishes, and textures. Perhaps one of porcelain’s greatest features is its resistance to wear and tear. Over time, other surfaces start to look worn and faded. You don’t have to worry about that happening with porcelain. It is resistant to chipping, fading, scratches, and stains. Choosing ceramic tile for your home flooring is an investment brimming with benefits. This is a high-quality product offered at an affordable price. A tile floor made of ceramic offers a strong and durable surface that effectively resists moisture and stains. It is also easily maintained and can be cleaned with just sweeping or dry mopping for dirt or dust. A mixture of water and general household cleaner revitalizes the tile’s finish. For the distinctive look of natural stone, choose slate tile for your home flooring. 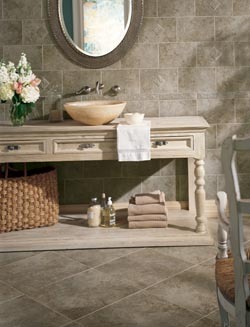 Each tile offers a unique beauty in rustic earth-tone colors and natural designs. Whether you prefer bold elegance or chic sophistication, this is the perfect flooring choice for your personal style. Naturally slip-resistant and durable, our high-quality tile looks great any room of your home. It is low-maintenance, non-absorbent, stain-resistant, easy to clean, and offers long-lasting beauty. Trust in our experienced team to provide you with a high-quality tile flooring installation in your bathroom, kitchen, or any other room of your home. Our trained installers effectively and efficiently manage every step of the installation process, from taking accurate measurements of your space to safely removing your old flooring before installing your new tile. A tile installation done by an inexperienced contractor may require a second installation. This not only costs your more money, but it prevents you from truly enjoying your new floors. Don’t let your money go to waste and turn to our professionals to get the job done right the first time. Along with our superb installation, we also offer some of the best warranties in the industry. Your satisfaction is our top priority, and we do everything we can to ensure you leave our flooring store satisfied. Among one of the many warranties we offer is the Ultimate Confidence Guarantee. If you’re not completely satisfied with your new 4- or 5-Star rated flooring within 30 days of installation, we will gladly replace it with a floor of equal value. We’ll even front the costs of the labor. Another warranty we offer is our Price Protection Guarantee. We refuse to be outsold by our competitors. If you find a lower price for a product of the same exact brand and style from a competitor, let us know. As long as the product was purchased in the last 30 days, we’ll happily refund the difference. Lastly, we want all of our customers to have the complete and total confidence in our work. Our contractors are highly trained and knowledge, so there should be no installation issues. On the off chance that one occurs, know that we’ll make sure to rectify it promptly and at our own expense. We are dedicated to ensuring your life-long satisfaction. Visit our showroom to learn more about the different services we offer. Contact us to see our showroom. We proudly serve the communities of Plaistow, Atkinson, Hampstead, and Kingston, New Hampshire, as well as the surrounding communities. We also proudly serve Haverhill, Massachusetts.